Let’s check in with Jen and Gaby – restaurateurs who have just moved to LA from Beijing for a fresh, healthier and sunshine-filled life. Jen says she has quite a lot of energy and feels like she’s getting healthier. Jen – Good eating begins and the Brain On tastes healthy! Gaby – First day, feels good and energized. Did a big X-terrain workout in the evening, feeling powerful, exhausted and good sleeping at the end of the day. Jen – So far, so good. Fabulous gym session this morning. XY – it’s a killer. I will get fit and healthy on this challenge!! My goal is to do all of the push-ups without resorting to my knees! Gaby – Trying to drink a lot more water and eating smaller meals, closer together. I think this diet will be good for the 30 days. I am trying to stop feeling lethargic from my usual regime of a couple of big meals. Jen – Big Headache this morning, Persevered with Morning Walk on the Beach and Protein Day. A bit blaagh, but I know that can happen when you change your routine. Gaby – Great running in the morning, lots of energy. Eating better. Finishing my meals before 9pm. Jen – Protein and Greens, early gym class – feeling renewed and full of energy. Gaby – Headache today. Took it easy and chilled out. Had some painkillers for my head. Not much eating today, not feeling good. Jen – Protein Only, 1kg down – YAY! Lots of water. Gaby – Felling a bit better today. Headache still here but not as severe, trying to decide whether this has to do with my diet or water. Did a workout in the evening. Jen – Easter at a Vineyard – some soul-food today with wine tastings, laughter and restaurant menu – made good choices though – fresh cold-cuts platter and salad. Oh, and dessert!! So much sweet! Gaby – Easter Winery afternoon. Wine tastings, good walk and good food. Feel like I have overeaten a lot. Headache seems to have gone. Jen – A few Easter Eggs and a family Easter Brunch and Lunch – tried to make good choices – healthy Loxs Bagel, coffee and fresh fruit. Gaby – Good meals but didn’t sleep well last night, I think due to excessive amount of sugar/chocolate! No headaches. Good late afternoon walk. Day off diet today. I woke up at the crack of Dawn for my 6 am class!! I have my BRAINON TO THANK…..
seriously this would not be possible!! Kept me going I have a busy day today …tomorrow is a friends Birthday and therefore in between my classes I must go and get cake and food !! I also Had a Doctors appointment…. You see while we where building out my Studio I sliced my foot, me being the baby I am with needles I refused to go and get stitches….and me being so determined I managed to work out and teach on my bad sliced DEEP toe…well it wasn’t healing as quick,and everyone was fearful of infections…..call me crazy BUT since I started taking the E3Live Brainon….the deep cut that hadn’t healed in 3 weeks all of a sudden was finally closing….at first I thought it was in my head….but literally in 6 days the inflammation went down and the Cut FINALLY closed…..When I went to the doctor he couldn’t believe in the last 9 days since he saw me how much different it looked!! and of course NO INFECTION!! YAY!!! AS usual I took my Renewme before lunch which holds me up pretty well not to overeat!! came home prepared food and cake for my friends Birthday lunch!! I forgot to take my Renewme before lunch. so when the cake came out…….. Yes it was ugly….i dove in and didn’t come up for air!! UGH i’m going to HATE myself tomorrow!! I FELT very sick this morning!!! Had my BrainOn and Green smoothie to “balance” out the bad I put into my body yesterday!!! the Renew me and the shot of BrainOn in the afternoon helped allot!!!! I had to teach and then go pick up my best friend from the air port who came to visit me!! Happy Birthday To me !!! My Best friend and I woke up made some Green juice and drank my Birthday Shot of E3Live BrainOn!! I Have a LONG day ahead of me so those two things kept me nice and energetic!! Had gluten Free Birthday Cake in the evening!! OH the Pizza foggy Haze the next day!!! THIS is brutal!!! Its unbelievable what gluten can do to you…and although it tastes yummy at the time of eating it, the things it does to your body are horrific…..I get this brain fog the next day and days after and my joints ache and are stiff and of course the Tummy Bloat,all of which are a DEADLY mix when practicing Yoga in a Hot room …I know my practice will suffer today!! I took BrainOn before I taught ….the haze and Fog cleared IMMEDIATELY when i took it!! and Renew me before I practiced ….PERFECT I was able to do my practice with less pain then I normally would have had after such gluttony!! Success I was able to go through out my day feeling some what normal!!! I had my closest friends over for Easter And Birthday Celebration!! Which means 5 Bottles of Champagne, some wonderful canapés ,and great conversation outside by the lake!! I knew as we finished that Final Bottle that tomorrow was going to be pain full, but it has been a great day!! OH the PAIN !!!!! 4 am wake up for 6 am class!!! I don’t know if I can do this!!!! Many times I thought I couldn’t!! So Thankful for my E3Live BrainON!!! It gave me the boost i needed to teach that class….but i have 3 more classes after this and the possibilities of me surviving are Slim!! I guess I was wrong though, I took a couple more BrainOn shots then usual and my Renew me and I went through my day, yes struggling Physically but mentally I was able to give 100% to my students like they deserve!! Just because I celebrated Yesterday doesn’t mean they need to suffer through a bad class because of that!! THANK YOU E3LIVE BRAIN ON!!!! By my 6 pm class I had even beaten the head ache and Tummy ache Champagne day after affects!! and I was able to give them 110% , I think I was even a little TOO energetic in class , keeping them a wee bit longer in the postures then normal 🙂 !!! AGAIN THANK YOU E3LIVE BRAIN ON!!!!! 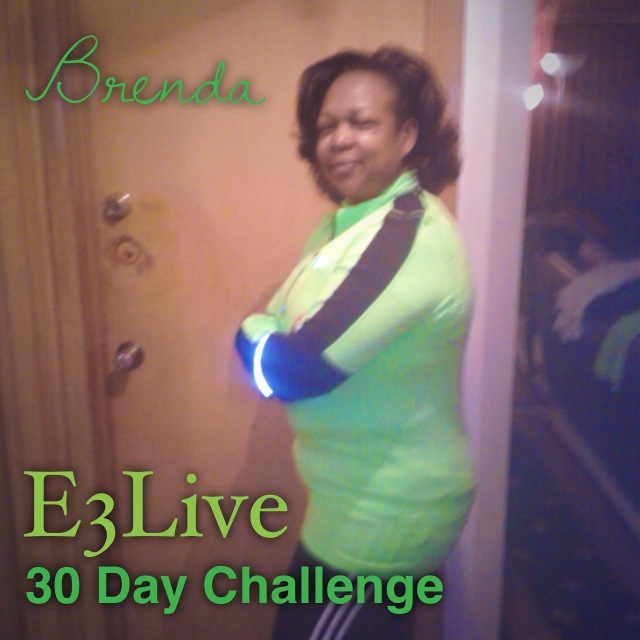 See what else Brenda has to say about week 3: E3Live 30 Day Challenge – Brenda Week 3 Video and read her journal below. Saturday, April 12th – Day 15. This is the day the Lord has made and I am rejoicing! Today is my 55 birthday and I am excited and very grateful in my heart! Another year means another chance to live life to its fullest and healthiest! I don’t think I have to tell you that my ‘birth-day’ started with a shot of E3Live BrainOn because that’s what I’ve been doing for the past 2 weeks and that’s not changing. I am assured this E3Live shot will give me the burst of energy I am going to need to celebrate this fabulously blessed day! To give you the clip notes of my amazing birthday, I spent the entire day with my awesome husband and daughter being pampered and getting my way. This day was an amazing day and I was able to hang out beyond my usual time limits and was not tired. I forgot to mention in other post that I have been sleeping like a baby. I know for a fact that is due to this product. In the past my sleeping habits were not the best but I am proud to say…’I have been getting some good night sleeps lately”…..THANK YOU E3LIVE! Ahhh………I still believe good things come on a Sunday morning! Woke up bright and early for morning prayer and guess what was first on my palate…..yep…….had a shot of E3Live! This was a continuation of my birthday celebration so my eating wasn’t the best this weekend. But my energy level was off the chains! As always, still taking my ReNewMe capsules with lunch. I’m loving it! I did something I usually don’t do on Sundays but today I took a bootcamp class at my trial membership health club. I was so pumped it was actually unbelievable! One funny thing happened was that my husband was wiped out after the class and I was ready to take another class. That was awesome and all due to this product! 6:30am – now I need my E3Live shot from all the celebrating….lol! Back to work! Went for a 30 minute brisk walk for lunch and wish I had another hour to spare. Took my 2 RenewMe capsules after my walk along with lunch. My eating is still not it’s best cause co-workers are bringing me cookies and cakes and I can’t be rude. I have to eat them….wink!wink. I have noticed a little that my appetite has changes. I get full fast. And I know that will eventually work for my good so I’m okay with that. Looking ahead to what the rest of the week will bring! 5am – took my shot of E3Live straight this morning before my 5:30 cycling class! This cycling instructor is not punk so I need my E3 shot just to keep up. Can I just say this E3Live product SHOWS UP AND SHOWS OUT in whatever I’m attempting to do. Yes and Amen! 5am – had 2 shots of E3Live this morning right before my cycling class. BAM! I was jamming in cycling class this morning. Once again E3Live to the rescue. My recovery time far exceeds my expectations. Wish I could say the same for my eating…….! Today was my 6th birthday lunch with a good friend. Since I’ve been on this challenge, I’ve lost 3 pds so I can only pray that I don’t gain anything. I am having a fabulous day. I am starting to hear comments such as, “your skin is so nice, slow down you are so hyped”. I promise you I have so much energy that I can’t believe I just turned 55 years young! 5am – took my shot of E3Live straight before my morning 3 mile run/walk! It took my body the first mile before E3Live kicked in but when it did, I was ready to go! This is a happy time in my life. A surprise to myself……………..I worked out again afterwork and I was NOT tired! Once again, E3Live has shown up and showed off for meYay! I must say since I started the 30 day challenge, this has been my BEST WEEK so far! 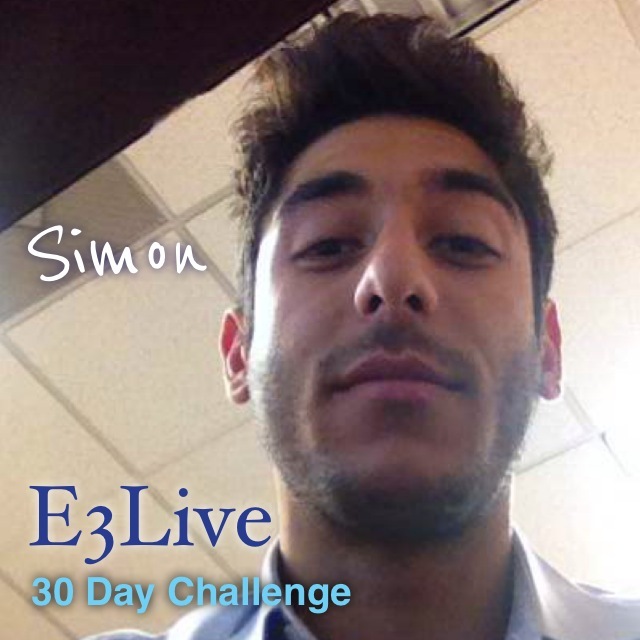 E3Live 30 Day Challenge – Meet Jen and Gaby! Meet Jen and Gaby! 2 re staurateurs who have just moved to LA from Beijing for a fresh, healthier and sunshine-filled life. They will be taking E3Live + BrainOn and E3 RenewMe for 30 days. Watch their video here: E3Live 30 Day Challenge – Meet Jen and Gaby! Gaby (42) is Brazilian) and Jen (39) is Australian. Why do they want to do the challenge? – to be brimming with energy, health, light and laughter – also to be fit and drop a few pounds! Specifically they want to each lose about 10-15 pounds of fat, to have energy, clear complexions, and a new outlook on life. 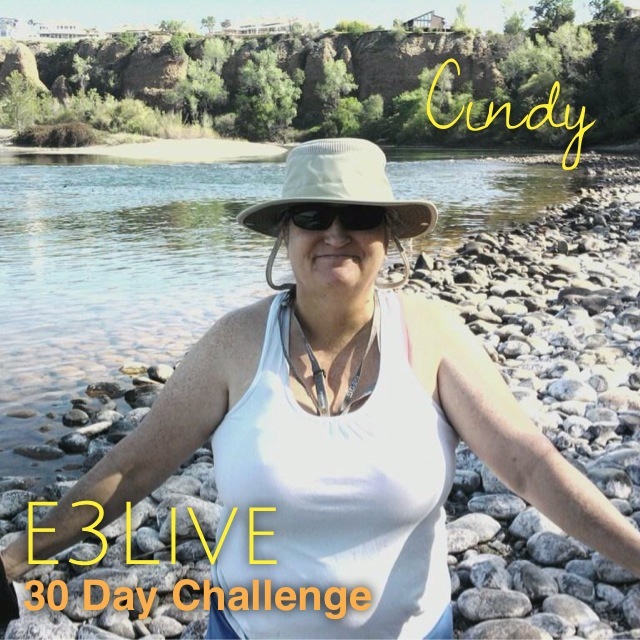 Cindy – a 51 year old disabled RN finished weeks 2 and 3 of her E3Live 30 Day Challenge. Check out her progress! Day 8. Still detoxing, but feeling the effects decreasing. In the morning I had physical therapy for back issues. The exercises while simple wore me out a bit. I took a nap today as I was a bit tired. It was a day to rest up and enjoy the process. Day 9. Hi E3Live. I woke up early again. It seems like lately I am waking up earlier, refreshed. The products seem to be working better than I expected. Just being able to wake up without feeling tired and run down is great. I find myself getting more things done during the day. Day 10. Hello, It’s a good morning. I am waking up with more energy and alertness. Its easier to get up and get going. Yea. Breakfast was a juice made from wheat grass, parsley, Swiss Chard, kale, ginger root, a whole lemon and tangerines juiced. Lunch was a bowl of blueberries warmed up in the dehydrator with some hemp seed sprinkled on. Today I worked out to Leslie Sampson. My legs worked better, my coordination was greatly improved. My muscles feel looser, easier to move. I was able to do all the arm movements too. It’s quite a bit of progress for me. In all I completed 45 minutes of working out, broken up into one mile segments. It’s been a very long time since I have been able to do as much exercise. I feel like I am on cloud nine. Thank you E3Live. Day 11. Well, I over did the exercise. I am so sorry E3. I felt so good yesterday that I got in 12,000 steps. That blew away my record. But unfortunately it created a setback. Today I can barely walk and stand. It’s an unfortunate side effect of having MS. You do too much and then you pay for several days or weeks. I don’t know how long it will last, but hopeful not too long. I sure did enjoy being able to move more. Next time I will have to work my way up more gradually. On the positive side my brain is working fairly well. It took a hit to, my ability to communicate cognitively which goes along with MS. But it is not as affected as it would of been without the E3 products. Day 12. Rest day. I am still recovering. I can hardly stand up to prepare foods or move around. It’s from doing too much the other day. Day 15. Improving slightly. I can stand for longer periods of time to make juice. Still not much energy or strength. I upped my dose of E3 to see if I can improve with more. Day 16. Improving again. I am able to get outside again to harvest produce for the juice. Yippie. I am still not up to my normal self. Don’t worry it happens if I do too much movement. MS is that way. I am getting around better in the house. I still have to take it easy. My body does not allow me to exercise much. In front of the TV I march a bit as it is all I can do for now. Day 17. Wow, how times flies. Since I had no detox reaction I again increased the dose of the E3Live BrainON. It is making me feel perkier. While I still cannot do as much as before which is my fault from overdoing the exercise. I am improving. I am able to increase the step count slightly. I am juicing for two of my meals which is not uncommon and eating dinner. Day 18. Can you believe it’s been 18 days on E3 products? My body and skin look the same, mentally I feel sharper. My head can get so foggy that it is hard to think to get thoughts out with the MS. Since E3 I am not having any issues with that. My step count is remaining steady as I don’t want to push it up higher yet. My body says to be cautious so I listen. Day 19. All is well. I am enjoying the beautiful spring-like weather. My quads are feeling a bit stronger so I am doing a little bit of gardening today. Gardening works out my quads like crazy. I am taking the E3 twice a day. I am going through it quickly, but I feel like it is the key to me improving. It feels like it is improving my ability to get around. Hopefully you folks don’t mind, but I love the stuff. Day 20. I am so happy to have been picked for the E3 contest. I can say the stuff works. The more you take the better you feel and of course the longer you take it. The difference is hard to describe, but I am enjoying the effects. The changes are subtle like improved muscle strength, improved feelings of well-being, improved clarity of thoughts.